This merry little truck mini round measures 5in tall by almost 8in wide. 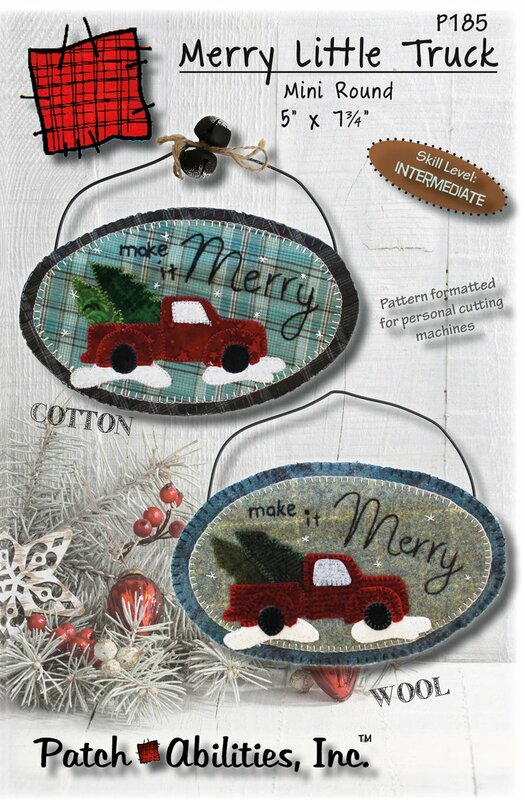 Fused applique featuring a vintage little old red truck bringing the family tree home for Christmas decorating. The words make it Merry, is embroidered using Valdani COLORFAST variegated perle cotton thread. You might ask "what is a mini round?". It's a unique oval shaped mini quilt. The oval shape gives lends it to be anything you wish - use it as Christmas wall décor (hung on a 6in wide organic-looking hanger by Ackfeld Wire), a large Christmas tree ornament, door decor (think door decoration for apartments or senior housing) OR table top décor. Machine stitch applique was used on the cotton model (using Valdani variegated machine 35wt thread - click here for more details), hand applique was used on the wool model. Beautiful in wool or cotton.